Shirring is so fabulous! 🙂 Love the dress. This is gorgeous! I love the fabric you chose and I really like the shorter skirt! thank you! i’m so glad i didn’t go with my initial plan! SO pretty. Nice work with the shirring. Past me tried shirring about three years ago but it didn’t want to happen. It works perfectly with this dress and that fabric. Such a clever skill. some machines just don’t take to the shirring elastic, i don’t know why. for me, i don’t have to change a single setting… lucky i guess! thanks! Love this dress. It’s so beautiful. I made my daughter a dress this summer and had to removed and reattach both strapes EVERY time she wore it. First they were too tight then too loose then they were uneven. I so wish I made them adjustable. I will difinately do this next time. thank you! the adjustable straps are pretty easy to put together, and you’re right–they’d be perfect for kids! shirring is obnoxious to do, not gonna lie! the sliders though are super easy. it does help to have an example in front of you for reference. glad you like it! Geez, I almost didn’t recognize you with your shorter hair! I thought you were your sister at first!! Such a pretty dress. I’m glad you got to wear it a few times, and you should definitely wear it a few more times with a denim jacket! how funny! even though i chopped my hair a while back i hardly ever wear it down… i just can’t be bothered to make it look nice! Beautiful! Hope you get to wear it a few more times! I never get tired of seeing gorgeous floral dresses – this one has such a lovely cross between modern and vintage. I’m guessing the shirring also makes it uber comfortable? All the benefits of a woven with the movement of a knit? thanks, i do love the romantic quality of the fabric—delicate and feminine! the shirring does up the comfort level, which is why i reached for it so many times this summer. an expanding back panel is always a plus! 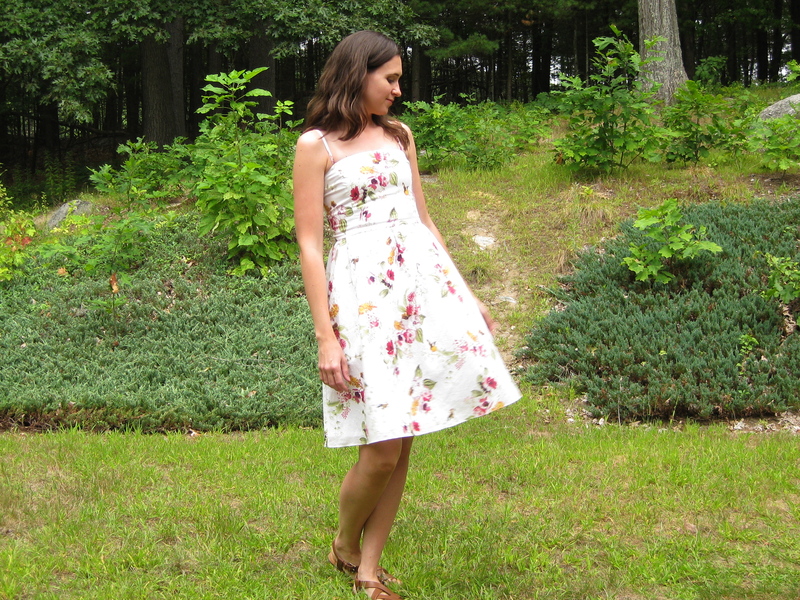 This is the perfect summer dress and it looks fantastic on you! I would totally wear this all winter with a cardigan too! thanks! i may sneak in some extra wears if i add tights! That is so clever to make it comfy with the shirring, but from the front it looks like such a lady-like dress. Very cute! thank you! i like the casual vibe shirring adds–keeps the dress from feeling too fancy. thanks kelly, i know i would have regretted not buying this fabric! Fabulous dress. 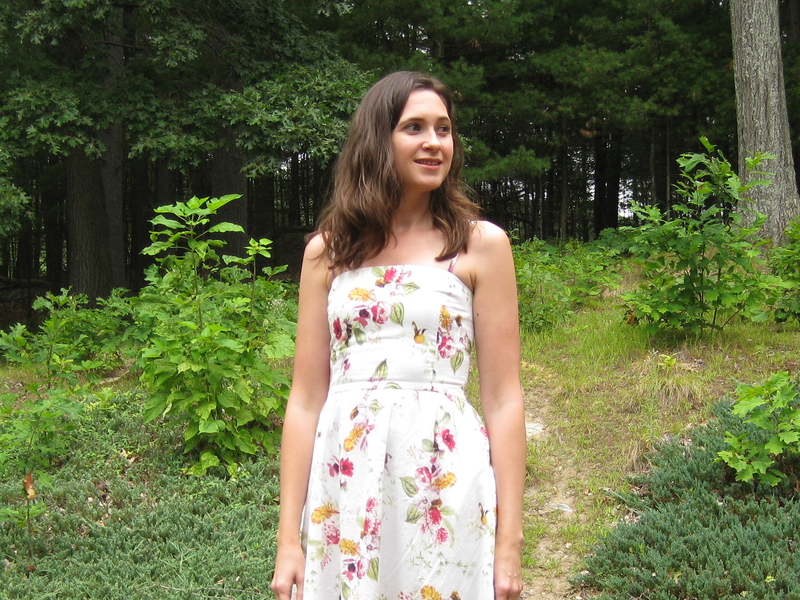 I have a RTW with exactly all those features, adjustable straps, shirring at back and a lightly gathered skirt (mainly at back) and I keep meaning to copy it – seeing your dress has inspired me and given we are heading into summer – yay! I love this on you! It’s so, so cute! Such a pretty dress. I totally hear you about the adjustable straps. And I love some shirring! This dress is so so gorgeous! That shirring looks amazing.